Want to make a delicious dinner without heating up your house? 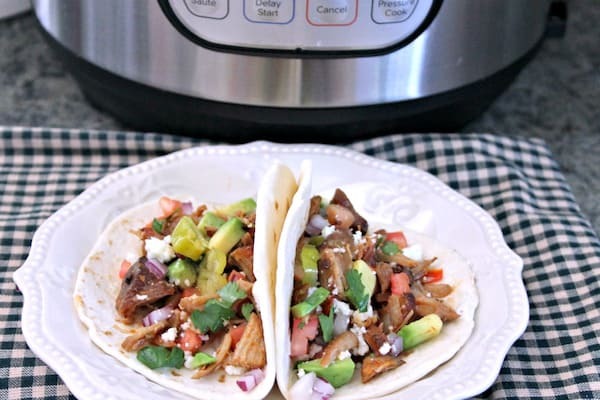 These instant pot pulled pork tacos are perfect! I heckin love my Instant pot. Especially in the summer. It seems like the instant pot seeps the least amount of heat into my kitchen when it’s cooking. I never thought anything would top the slow cooker, but here we are. Funny story: These days, my kids like to insist on eating their taco filling on a tostada shell. As much as I try to tell them it’s wrong, they don’t care. They like crunchy tostadas. But will they eat a crunchy taco shell? No. Why? Because they fall apart as soon as they take the first bite. I get it. I kinda wish I’d known about tostada shells when I was a kid, because I remember that crunchy tortilla heartbreak as a kid too. But seriously, what’s wrong with a corn tortilla soft taco? We haven’t done a lot of grilling this summer because we haven’t managed to get the porches and outside of the our house complete (how do people find time for home improvements?? It took us nearly a year just to get this house livable! 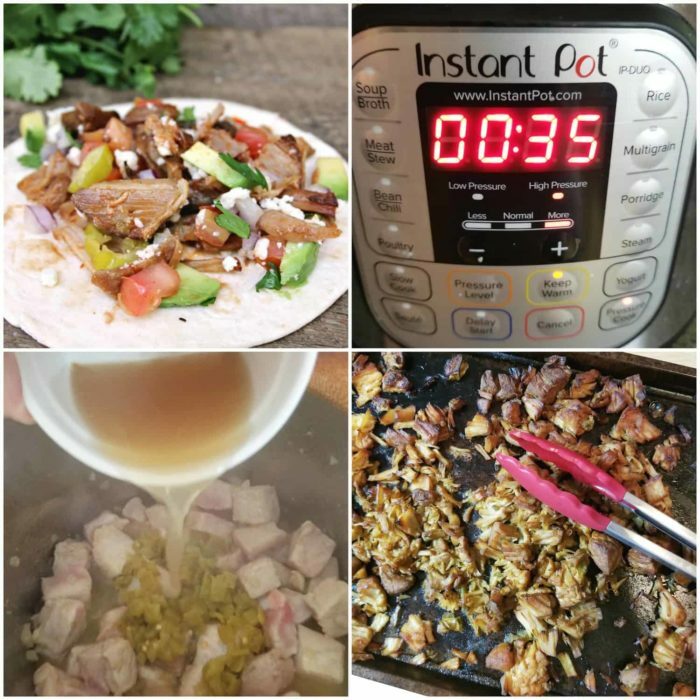 ), and I’m hoping to remedy that before the end of the summer, but for now, in the absence of grilled pork tacos, I gotta say, I’m pretty darn happy with instant pot substitutes. And this recipe? Well, if you follow store sales, you know that pork loin and shoulder goes on sale for pretty decent prices pretty often. 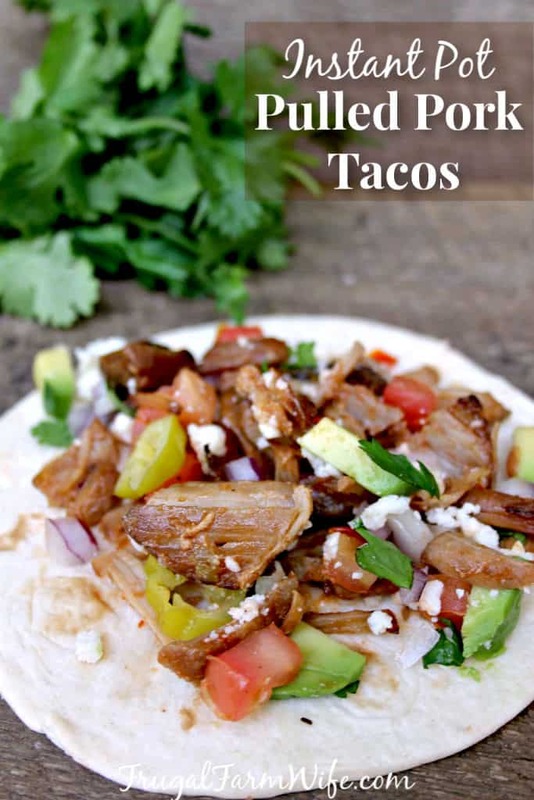 So you could say the instant pot pork tacos are not just summer friendly, but super frugal as well. Especially for those of us who have a thing for making homemade corn tortillas. And we haven’t even talked about the way they taste yet! I mean, what more do you need to say than “tacos”? There is SO much flavor packed into this little recipe! You will fall in love with the way the garlic, onion, and green chilis meld with the orange and lime juice. And my kids especially love that little hint of cinnamon. Just writing about it is making me hungry. Seriously. Add oil and butter and allow to melt. Add garlic and onion. Cook about 2 minutes, or until garlic is fragrant and onions are translucent. Add pork and brown, but do not cook all the way through. Add orange and lime juice. Add cinnamon and taco seasoning. Set Instant pot to high pressure and 35 minutes. Close lid and make sure venting is turned off. Allow to release pressure naturally for 15 minutes. Release remaining pressure by opening valve. Spoon pork onto a baking sheet and pull apart. Place under broiler until crispy. Reserve about a cup of the broth from the Instant pot and brush over the pork.